One year ago this week, Parsantium: City at the Crossroads was published after more than a year of writing, revising, editing, proof-reading, layout and design by me and Kate. We published the book through our own imprint, Ondine Publishing, because RPG contracts are largely work for hire, with the rights to your work sitting with the publisher. I’d been running my Parsantium campaign for five years, my players had enjoyed it (and still do!) and if I was going to turn the city I had created into a game supplement, I wanted to keep the rights to it, as well as any profit from its sales. Also, Kate is a professional editor and has published books for other authors so I knew we had the necessary skills. I hoped to sell 150 copies and, more importantly, hoped that people would like the book. I am delighted to report that Parsantium has sold nearly 500 copies to date, and has picked up some great reviews from the likes of Endzeitgeist and others. And I’ve been thrilled to hear about people running games in the city. I thought it would be interesting to share a few stats with those of you considering doing something similar and publishing your own RPG book. As well as producing a PDF of Parsantium, we set up Print on Demand versions with both One Bookshelf (drivethrurpg.com and rpgnow.com) and directly with Lightning Source. We also made a print and PDF bundle available for $3 more than the price of the print edition alone. Jon Roberts’ map of the city was so gorgeous that we included this as a separate high res file to anyone buying the PDF or the bundle. 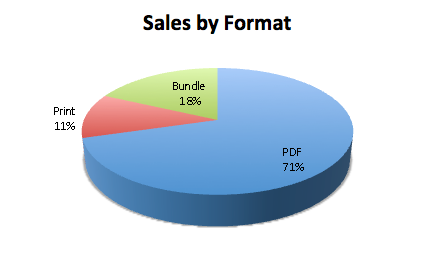 As you can see from the chart, PDF was by far the most popular format, helped by including the eBook in several 30% off promotions on OBS and Paizo.com (GM’s Day Sale, Christmas in July, Not Going to GenCon etc). The print/PDF bundle did well too – a high percentage of OBS and Paizo customers who wanted a print book also wanted the convenience of a PDF and thought an extra $3 was a fair price to pay for it. I knew I wanted to have Parsantium available on One Bookshelf and Paizo, but I was also keen to have the print edition available on Amazon and through other online bookstores. It’s not cheap to get your book set up with Lightning Source directly, but this does mean it gets an Amazon listing and is available to order from Barnes & Noble, Waterstones etc, and is the easiest way to get print copies to Paizo. It’s also very straightforward to get copies for yourself to sell to friends or at conventions. 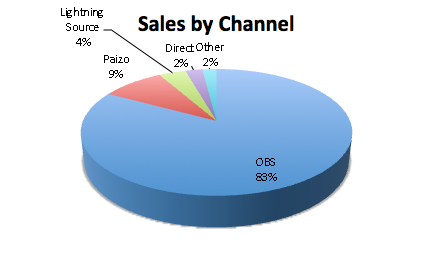 The chart shows the sales split by sales channel for Parsantium. The vast majority of sales came through OBS which isn’t surprising, but significant sales went through Paizo, helped by the Pathfinder logo and compatibility, and to a lesser extent, Lightning Source (which includes Amazon). 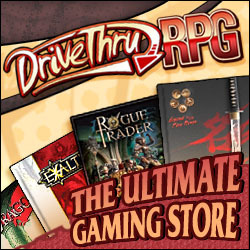 Direct sales were print copies I bought from Lightning Source at cost and sold myself; Other includes d20PFSRD.com and my two local game stores. Thanks to everyone for the support you’ve given Parsantium in the last twelve months by buying the book or talking about it. It was a lot of hard work for both of us getting the book out there but I’ve enjoyed (almost) every minute of it and I’m looking forward to writing and publishing two follow-up products – Icons of Parsantium and Tales of Parsantium – in the coming months. If you’re thinking of publishing your own RPG and have any questions, please let me know in the comments below and I’ll do my best to answer them, or feel free to contact me. This entry was posted in Design Diaries, News and tagged self-publishing. Bookmark the permalink.